To play Ryuutama, you need a set of multi-sided hobby dice (4, 6, 8, 10, 12 sided dice). You can buy these at any hobby store or online. You can also instead download free dice-rolling applications for your phone or tablet PC to use at the table, if dice are hard to come by. You also need friends, paper and pencils. Most of the action in Ryuutama comes from talking and acting in character at the table: When you talk to the owner of a local bakery, you speak to the game master as if you were your character. Sometimes, when you try a challenging act, you have to roll the dice! The Game Master or GM will tell the player which dice to roll. Haruka’s player Ashley created Haruka with a strong body (STR = Strength) and mind (INT = Intelligence), and an incredible spirit (SPI = Spirit). However, Haruka is not as nimble as other characters (DEX = Dexterity). Those “d” values are the dice Ashley will roll when she has Haruka do something challenging or dangerous. If Haruka was trying to climb a mountain with rope and harness, that would likely require Strength and Dexterity. The GM might say “Roll your Strength and Dexterity, and try to beat 7.” Ashley would then roll one six-sided die and one four-sided die together, and hope the value is higher than 7! If Haruka wants to win a crepe-eating contest, the GM will likely have Ashley roll Strength and Spirit. If Haruka wants to try to remember a fact she learned about a new place, she will have to roll Intelligence and Intelligence (two six-sided dice), because you always use two dice/abilities to do something. It’s a fairly easy system. ✿ As you explore, you gain experience points. Experience points are awarded mostly for travelling under difficult conditions, but you can also receive them by helping people with problems, completing tasks, or defeating monsters. Experience points will help you to level up and gain more abilities! ✿ There are four primary character classes: Minstrel, Healer, Merchant and Hunter. There are also three additional classes: Artisan, Farmer and Noble. Each one has some advantages. ✿ There are then three character “types”: Attack, Technical and Magic. Any class can focus on weapons, skills or magic depending on which type they choose. Attack type is more skilled in battle, technical type can boost their abilities further, and magical can cast both sorcery and seasonal spells. ✿ There are two types of magic: Sorcery, which contains spells that can heal, tame animals, create traps and more. Each magic-type character also focuses on a season, which grants minor but useful spells with themes related to that season: Create a snowball storm; make a companion feel like they just took a wonderful vacation; create a cubic meter of dried leaves; and so on. The characters choose to start on the front or back line, and attack the enemies. 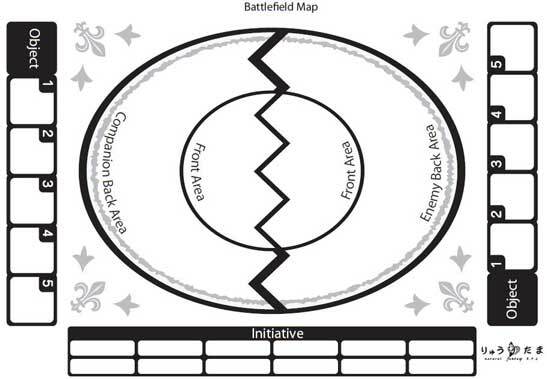 The players can also create “objects” (a loose rock; a sturdy tree; the bright moon overhead; etc) that are on the battlefield: Using those objects grants the players a small advantage! Finally, the GM also creates a character, complete with a character sheet. This character is called the “Ryuujin”, or “Dragon-Person”. You’ll notice in the comics at the top and bottom of this section, the characters are doing things, and in the background on the right, there is a little winged character watching from afar. That is the Ryuujin. ✿ The Ryuujin have their own goals. There are four types of Ryuujin, each with their own “playstyle” and abilities. They become more powerful and level up as the characters participate in stories. Ultimately, they are silent companions of the players, and stay hidden most of the time. Later in the game, they may reveal themselves to the characters: “I have been with you all this time”. ✿ The Ryuujin can carry Artefacts, deeply symbolic items which change how the game rules work: A red dragon carrying a bow means that ranged combat rules work a little differently. A green dragon carrying a torch means that the characters gain double experience from the adventure. ✿ They also use powers to help the characters in a pinch: They can provide bonuses to the characters; allow them to roll again; have the players suddenly find food and water; or even, on rare occasions, rewind or fast forward time! While the GM themselves provide adversity and challenge to the players and their characters, their Ryuujin provides support and help through some sticky situations. If you are familiar with tabletop RPGs, see the Unique Elements section of this website to learn more about the special rules of the game.